Here at “someone else’s lilypad” it’s all about cost. This costs X but we only get Y back. That’s fine, it’s a business and we’ve got to make money. Why then is it so difficult to get a straight answer about how much something costs from the people who buy things? Captain Spendy: We’re spending a darn fortune on ink cartridges. It needs to stop dammit. Big Boss: Yes, I agree. Mr hoverFrog, what are the alternatives? Me: How much do we spend? How much do we use? There are several options but it all boils down to the capital outlay and the cost per print. You want a decent return on the investment. Me: Let me know when you do. Me: OK. *glances at printout from Rip Off PC Company That We Don’t Use Anymore* Um this works out at 59p per page of colour printing. How does that compare with what you spend now? I can see this going on all day. I may have to kill someone soon. WHY WHY WHY can’t the yoof a today speak proper English like what I does? Surely it’s an affectation rather than a lack of education? * Answer the question on your blog. * Link to the person’s blog who tagged you. * Link back to the original meme. * Post these rules on your blog. * Tag at least 5 people at the end of your post. * Let each person you tag know that they have been tagged. Simple faith is like that of a child before it is corrupted by vicious fact and the realities of a harsh world. How anyone hangs on to it as they go through life escapes me. I’d imagine that such faith would be shed along with belief in the Tooth Fairy and Father Christmas. Seeing that it isn’t has made me consider that it might have more to it. Perhaps it’s because we ask for miracles from the Tooth Fairy (who changes old teeth for money) and Santa (who magically brings gifts on Christmas Eve) as children but learn that our parents actually perform these ‘miracles’. Whereas faith in the divine is less refutable given the vagaries of the miracles requested. Well most people I know don’t give a monkey’s about religion so just go ahead and tag yourself. I’m trying to find out when the last delivery date for Christmas cards to the US of A is. Don’t bother with Royal Mail because their stupid website seems to indicate that they don’t deliver post. I’m not sure if the site is accurate or not. You can’t get through on the phone either. Maybe I should write to them. 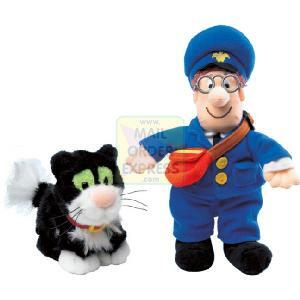 Postman Pat has been added to my human cull. And his bloody cat an’ all.